Singaporean actresses, Zoe Tay (郑惠玉) and Koh Ya Hui (许雅慧) attended the 2013 Annual Star Awards held in Singapore on April 21, 2013. 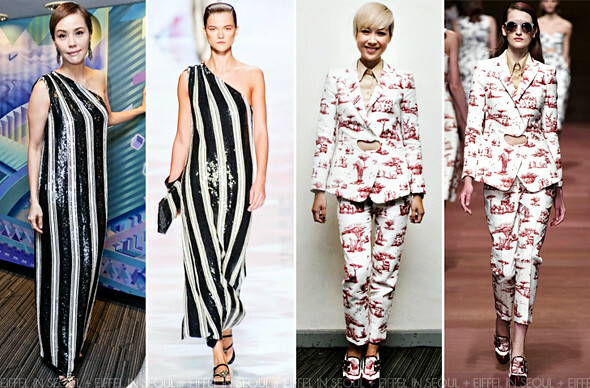 Zoe Tay (郑惠玉) wore a sequin one-shoulder stripe gown from Etro Spring/Summer 2013 collection. Her look was accessorized with a pair of chandelier earrings. Koh Ya Hui (许雅慧) was the only female actress that suited up that evening. Wearing a gorgeous Safari-printed runway look from Carven Spring/Summer 2013 collection. Her look was completed with a pair chunky pumps from the collection. While I was underwhelmed by Zoe Tay (郑惠玉)'s outfit, I absolutely adore Koh Ya Hui (许雅慧) look. It's not often we see an Asian look that great in blonde too.